Why is My Fluorescent Light Tripping the GFCI Breaker? What Is an ARC Fault Breaker? Circuit breakers, whatever their type, share a common function---to protect an electrical circuit against overloading and to avert damage to the circuit and the appliances connected to it, and the possibility of fire. They achieve this by breaking the circuit with a gap wide enough that an electric current cannot bridge it, but which can later be closed again by resetting. They are, in other words, a kind of automated switch. A circuit breaker interrupts an electrical circuit whenever the current in the circuit exceeds a safe level. Unlike a fuse, which has to be replaced once it has "blown," a circuit breaker can be reset an unlimited number of times. The essential elements of a circuit breaker are a switch and a current-sensitive mechanism that will move the switch and break the circuit when the current exceeds the breaker's rated level. In domestic breakers, the force that drives this mechanism is provided either by a bimetallic strip or an electromagnet. In the case of a bimetallic strip, the higher current makes the strip bend to move the switch. In the case of the electromagnet, the increased current increases the magnet's force, enabling it to move the switch via a linkage. Lower voltage circuit breakers---the kinds that are used domestically---are generally divided into three groups. The most common is the molded case, or MCCB, type; the next step up is the insulated case, or ICCB type; and for medium voltage and amperage, the metal clad breaker. Circuit breakers are rated for the wire capacity and load of the circuit of which they are a part. This is expressed in amps and volts. Circuit breakers are available in a vast range of sizes, suitable for protecting anything from a 110-volt domestic lighting circuit to a high voltage circuit carrying enough power for an entire town. Common voltage ratings for low voltage circuit breakers are 120 volts, 240 volt, 277 and 480 volts AC. Typical breakers for domestic 120-volt circuits are 20 and 15 amp. Large appliances such as water heaters, ovens, air conditioners and clothes dryers are protected by larger breakers on dedicated circuits. Main household breakers are typically 100 amp, although recently, with the increase in domestic electrical consumption, 150 amp and 200 amp main circuits have become more common. Circuit breakers for 120-volt domestic circuits take up a single slot in the electrical panel, while those for 240-volt circuits take up two slots. 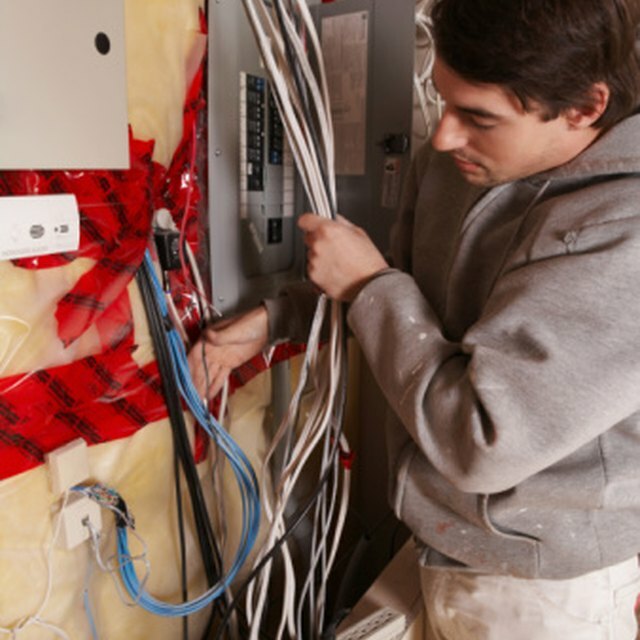 Because of the risk of electrocution from a wet appliance or switch, you should always use a ground-fault circuit interrupter (GFCI) to protect circuits---and people---in potentially wet situations such as outdoors, the kitchen and the bathroom. James Dixon has been a professional writer for nine years, during which he has contributed feature articles to magazines such as American Angler, Art & Antiques, Office Buildings and Quest. He holds a degree in classics from Cambridge University and is currently the house-magazine editor for a non-profit. What Does Non-Circuit Limiting Mean? What Is an Sf6 Circuit Breaker? What Is the Biggest Size Single-Phase Motor? What Is a Momentary Push Button Switch? Why Do Household Circuit Breakers Keep Breaking? What is a Current Limiting Circuit Breaker? What Is a Branch Circuit?